Since a very young age violist Nora Romanoff-Schwarzberg gives concerts worldwide both as a soloist as well as a chambermusician in prestigious venues such as the Salzburg Festival, the Vienna Konzerthaus, the Theatro Colon de Buenos Aires, the Salle Pleyel in Paris, the Vienna Musikverein, the Progetto Martha Argerich in Lugano, Les Classiques de Villars, the Andrey Sacharov Festival and Valdres Sommersinfoni, among many others. As a soloist she has performed with the Orchestra della Svizzera Italiana, the Zagreb Chamber Orchestra, the Orchesta Filarmonica di Bacau, the Kristiansand Symphony Orchestra, the Philharmonic Orchestra of Irkutsk and the Argentinian Camerata Bariloche. As a chamber musician she played aside stellar musicians such as Martha Argerich, Mischa Maisky, Gabriela Montero, Lylia Zilberstein, Renaud Capucon, Gavriel Lipkind and many others. Born 1985 in New York and moved to Vienna at a young age, Nora came in contact with artists such as Isaac Stern, Martha Argerich, Mstislav Rostropovitch, Zubin Mehta, Yehudi Menuhin and Valentin Berlinsky, who were important inspirational guides in her formative development. At age six she started playing the violin under the guidance of her mother Dora Schwarzberg. 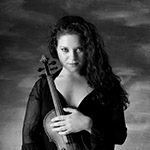 She had her debut as a soloist at the Vienna Konzerthaus at the age of 11. Since 2002 Nora devoted herself to the viola and soon began her path as a soloist and passionate chamber musician. Her current repertoire comprises more than 70 compositions, ranging from early to contemporary music. Her mentors and teachers include Yuri Bashmet, Hatto Bayerle, Michael Kugel, Thomas Kakuska and Igor Sulyga. In March 2014 she succesfully earned her “magistra artium” degree from the university of music and performing arts Vienna. She has been prizewinner at several international competitions in Italy, Austria and Croatia and was an elected artist for the Yehudi Menuhin Foundation “Live Music Now” in Vienna. Nora Romanoff-Schwarzberg is one of the core musicians of the “Podium Festival Esslingen”, that has established itself as one of the most innovative and successful chamber music festivals of the recent years. She is also the co- founder of the “Podium Festival Mödling”, the first of it ́s kind in Austria, that took place in September 2013. A passionate teacher and mentor, her pedagogical activities began in 2008 – since then she has been giving masterclasses of viola, violin and chambermusic in Norway, Israel, the USA, Latvia and Slovenia. EMI Classics released 9 discs with her participation, recorded live from the “Progetto Martha Argerich”, several of which received “Grammy” nominations. She furthermore recorded for Gramola and Naxos, as well as numerous radio broadcasts throughout Europe. Nora plays on a 1790 Pietro Pallotta Viola, that has most generously been donated to her by the late Lady Margaret Kagan.